It's not showing tonight by me it's showing all next week every night and day. Hopefully I'll catch one of them next week. I'd have to watch it again to be sure, but Labyrinth is talked about briefly and there are a couple of scenes. A brief mention that he worked on Muppets at Disney World and then a clip of Clifford on Arsenio. No mention of Dinosaurs, Dog City, etc. I cannot even begin to put into words just how incredible, spectacular, inspirational, heartwarming, touching, poignant, and superb this documentary was! It was absolutely amazing, I was nearly in tears as I was watching it, to think what I've been missing... and then as it was going off, I was almost in tears again because I didn't want it to end... I loved this so much, I was surprised that I was able to take in a few little tips on puppetry that I hadn't even thought of before from watching Kevin teach the puppeteers of the French co-production of SST (felt a little sorry for that one lady who couldn't quite get the hang of it, but it is a lot more difficult than it looks), even down to the end of the special where we get to see Kevin give Tau Bennett a look around the workshop and everything. I hope this DVD isn't going to be hard to find... I have a feeling it will be, but I would love to own it so badly, lol. Muppet fan 123, Cindy, CensoredAlso and 1 other person like this. I really enjoyed this documentary, I loved how much footage and photos they were able to find, especially featuring Richard Hunt. Kevin's story is very inspirational to anyone trying to make it in a tough business. And I really loved the part where Elmo narrates Kevin's daughter's birth, that was priceless. 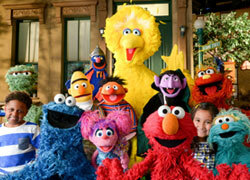 While this documentary did not change my cynical opinion of Elmo's World, lol, I'm still very glad it was made. Actually, it was with great relief that my wife and I watched this on PBS and found that this wasn't the Elmo-centric piece we feared it might be. No offense to Elmo (who can occasionally be a very funny and versatile character) or Kevin Clash himself, but a little of that fuzzy fellow goes a lo-o-o-o-ong way. Instead, Being Elmo was more of what the subtitle promised - A Puppeteer's Journey - and we loved seeing the footage of a younger Kevin and his early puppet performances. We learned a lot (I had NO IDEA he was involved in Captain Kangaroo or turned down The Dark Crystal!) and it was a kick to see so much video and photography tracing not only his own career growth, but the legacy of Jim Henson and his merry band of Muppet-makers and performers. In fact, the most touching parts of the documentary had to be the scenes with Kermit Love acting as a mentor to Kevin. 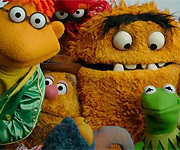 One of the reasons the Muppets have always appealed to me as an entertainment franchise is that everyone involved just seems so human and warm and welcoming - Kevin Clash included. Still business professionals, of course, but it seemed that Jim Henson imprinted a sense of people treating each other well that many other workplaces would do well to emulate. Very cool to see the Arsenio Hall Show clip of Clash, Henson, Kermit and Clifford. It's too bad that the piece didn't showcase more of Kevin's non-Elmo work of the past two decades (I would have loved to hear his thoughts on Clifford's starring role on Muppets Tonight) but this was a terrific, well-rounded documentary, all-told. Question: While watching this, did anybody else harken back to the segment on Kevin and Elmo from A&E Biography's Sesame Street special from early 2001? I always thought that was a beautifully-done piece (from an exceptional overall production) and I never forgot the wonderful sound bite from Kevin about people being surprised to learn that "Elmo was black": "I tell them, 'Well, he's not - he's RED!'" CensoredAlso and Phillip like this. While watching this, did anybody else harken back to the segment on Kevin and Elmo from A&E Biography's Sesame Street special from early 2001? THAT was the special that made me want to be a puppeteer. I watched this just yesterday on PBS. The Jim Henson Memorial part made me want to cry. (Hahaha... ) This is a GREAT DOCUMENTARY! Yeah, I watched this recently with my fiance and we absolutely loved it. Fantastic documentary and a genuinely inspirational story. I loved it! And, being the out-take/blooper/out-of-character that I am, I loved the bit at the beginning when Elmo bit the cheese and threw it across the room. The phrase "You wanna a piece of Elmo!" needs to be the battle-cry for all Elmo supporters. If you're not an Elmo fan watch this movie and you will become one. How could you not? Yorick and Cindy like this. It's being shown tonight at 9:00 to 10:30. I guess that means there are no commercial breaks (which is a good thing!). I'll post my thoughts tonight or tommorow morning. Well I finally got it today. And it is a good documentary. I was a little surprised by all the images from The Muppet Show, which Clash did NOT perform on, as well as all the Sesame Street clips from before he joined. I expected Richard Hunt's Elmo, and maybe a few clips from when the show began, but was still a little surprised. It's cool that the Ferlinghetti Donnizetti clip chosen is the one from the out-of-print "Getting Ready to Read". When Clash started talking about that character, I was expecting the "Rapping Alphabet" clip, and hoping for some Ferlignhetti clip I hadn't seen before. It's a shame that when Clash talks about working on The Muppets at Walt Disney World they never show any clips or behind-the-scenes footage from that special. Maybe Disney didn't want to loan footage or charged too much, but they did manage to obtain footage from one of the Muppet Meeting Films (the only Disney-owned footage that appears in the documentary). Interesting how on the packaging and main menu it mentions that Elmo is a trademark of Sesame Workshop, but doesn't mention the same about Sesame Street and its characters (and should I be surprised it doesn't give a trademark credit for the Muppets?). And I didn't notice this kind of trademark credit in the credits. So in both this and the autobiography, Clifford gets the same amount of coverage, both for his appearance on The Arsenio Hall Show. Too bad neither acknowledges Clifford as a character on The Jim Henson Hour or Muppets Tonight (or The Muppets at Walt Disney World). Although there's no talk about Dinosaurs, it is great that the talking Baby Sinclair doll appears in the background when Kevin's mom talks. And during the Muppet Workshop scenes near the end, it's cool that some of the puppets from The Wubbulous World of Dr. Seuss can be seen in the background (I would have thought they'd keep the Sesame Street puppets seperate from other Henson puppets while filming the documentary). The only things I would have really changed about the documentary would be some clips of Leon from The Jim Henson Hour and a section on Dinosaurs, and the only change I'd make to the DVD would be the inclusion of some bonus Sesame Street clips. Otherwise, it's great, and I can't wait until the Caroll Spinney documentary (but I was already excited about that one). I liked the many photos of Jim and the rare clip of Wogan interviewing Kermit. When I saw the footage of Kevin visiting Kermit Love at his workshop, my first thought was "did Kevin bring a home movie camera on his trip?" But then I saw the "thoughts from the producers" feature where the footage was talked about. Interesting story on how they obtained it. I wish they would have obtained footage from the 1979 Macy's parade. I wonder if that footage still exists. It was great seeing the photo, but then while talking about Kevin's performance as Cookie Monster they showed footage that's obviously from a more recent parade. The stuff with Kevin mentoring that kid was better than I'd expected. After seeing him name the various people in that photo (even Caroly Wilcox! ), I'd like to see him contribute to a Muppet Mindset article. The bonus feature footage is also interesting. So he was talking as Baby Bear in the float? Can't quite tell if that was just before the parade started or if he could talk throughout the parade. I would have thought the performers would have to be quiet during the parade (only vocal through the musical performance, which I assume is pre-recorded). Though it reminds me of when I read in Kevin's autobiography that he lost his voice after performing Cookie Monster in the float. I wondered why he would have talked so much while being an extra performer. During the audition footage for Captain Kangaroo, it seems both characters shown DIDN'T sound like any Kevin Clash character I knew at first, though after a few words of dialogue they sounded like other characters. At first the first character sounded a bit like Oscar to me, and the next one initially sounded like a Jim Henson character to me (that second one also kinda looks like the hand puppet of Junior Gorg that's been for sale the last few years). I love the movie. Mr. Clash is super! I agree about the audition footage for Captain Kangaroo; there were a few moments where Kevin sounded very much like Jim! Very nice to see and hear Richard Hunt's Elmo, as well! So much more to talk about regarding the movie, but these are my thoughts for now! I know that Kevin has done a lot more then just Elmo but the movie is just not about that. It's about him and Elmo as a team. I want to be on Team Elmo! Had the chance to watch it last night. It's a great documentary, I never realized how talented Kevin is! I always find it hard to believe that he's the guy performing Clifford. He's really good! I had no idea how they had footage from Kevin in Kermit's workshop though, did he bring a camera? I liked hearing Richard Hunt's Elmo, I never heard it before, it's kinda weird how it sounded. I cried by some scenes but I can't really remember when. I think it was by the part with the kid who's dying wish was to meet Elmo. I just know I cried about something! Was Whoopi Goldberg narrating the whole thing? I only started noticing it near the end of the film. Was glad to see and hear Carol Spinney and Frank Oz. But they're only in the movie for about 10 seconds max. And I can't even remember what Frank said! This movie is so inspiring. I just have to watch it again. Maybe I'll watch it on Wednesday at 2:30 on PBS. Whenever I have the chance! I was confused by that as well, but in the "thoughts from the filmmakers", one of them mentions that at all Q&As for the films people asked about that. She says it was for a syndicated show (she doesn't say the name of the show) which was having some focus on Kermit Love and the people who made that show asked if Kermit knew of any aspiring puppeteers they could feature, and he thought to invite Kevin for the show. That feature also explains the trouble they went through to get the footage.